We have a lovely new little blog where our posts will now appear. This blog page will be deleted soon. 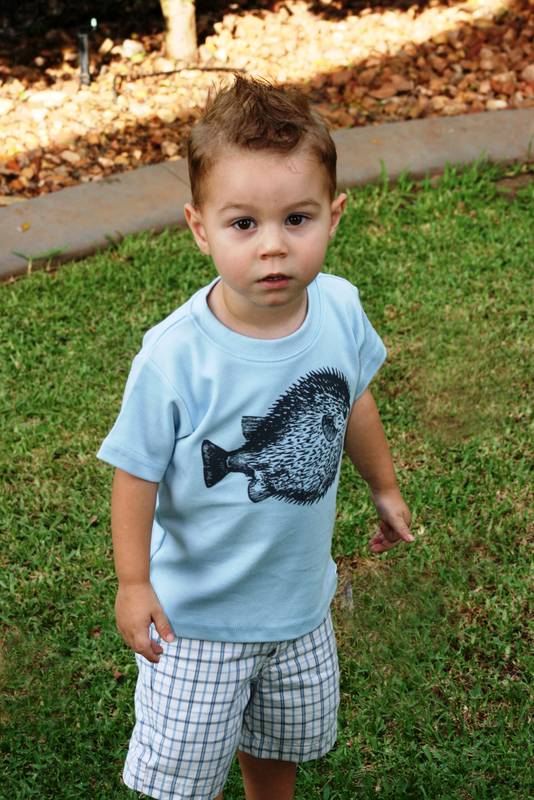 New to the range of boys shirts are these uber cool Puffer Fish Tshirts. 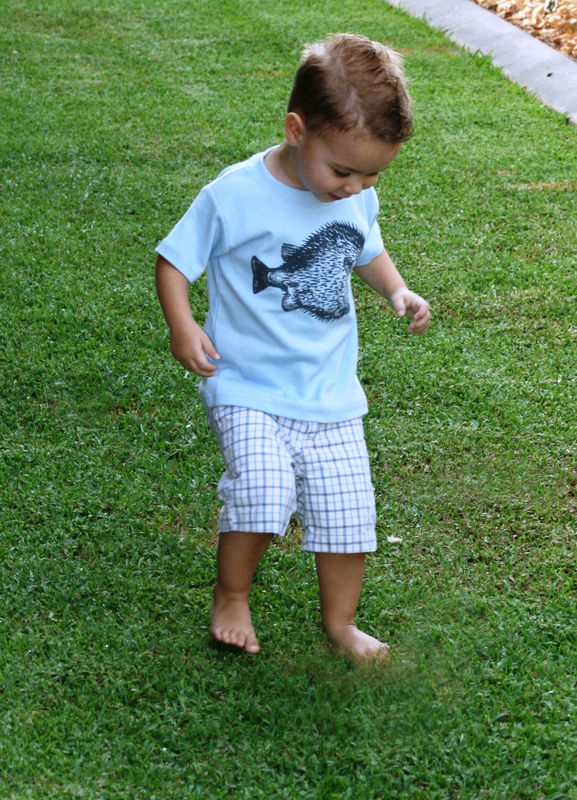 Vintage style fish image in slate grey ink on the sky blue tshirt looks really awesome, subtle but eyecatching…. (ok so that is a complete oxymoron but I hope you get what I mean?). 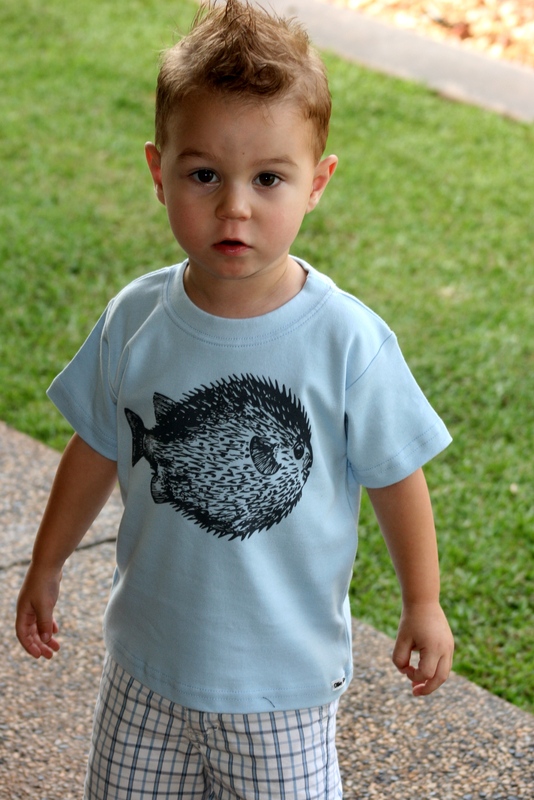 In t-shirts size 12-18m, 18m, 2 and 4. There are also a very limited number of tank tops available too. Found in FOR BOYS. How adorable is my little model Cooper!? Progress on “that list” from a few posts ago…. ** UPDATE…being printed right now!…then will collect end of this week and get some shots of my gorgeous model in them. * Finish the tanks for the gorgeous new tulle skirts. 90% done. **UPDATE-FINISHED and ON SITE NOW! And other things not on the list but I managed to get done…. Slowly but surely getting there. And I am pretty used to dealing with the frustration of not getting all the things done that I had wanted to for the month…..so they will go in the In Progress baskets or just be put off for another day….or sometimes never! And here is how I keep Esmae busy whilst I get a few jobs done. She has been comando crawling for a week or so and is just starting to get up on her knees now. And Sabre keeping herself busy by racing around the house on the scooter! It efinitely is not ideal to have her on the scooter inside but with the heat in the middle of the day and the current mosquito plague it is the only way she can use it. Well ….things aren’t getting done blogging here………..so BACK TO IT! 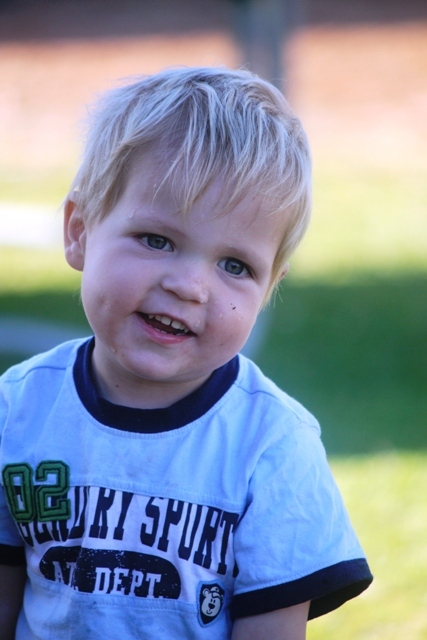 Eeek, my baby boy is nearly 3 years old, where has the time gone? I think the last 3 years have really flown by, probably because I haven’t sat still much in all that time, but really they have gone super fast – ridiculous really. We have started to plan the 3rd birthday party with gusto, it will be a loader, digger, dump truck affair as Ari is absolutely and totally in love with the yellow and black trucks, and at the ripe old age of nearly 3 will quite happily correct me if I should call a machine by the wrong name, including Bobcat, which he insists is a Catbob, and not the other way around. 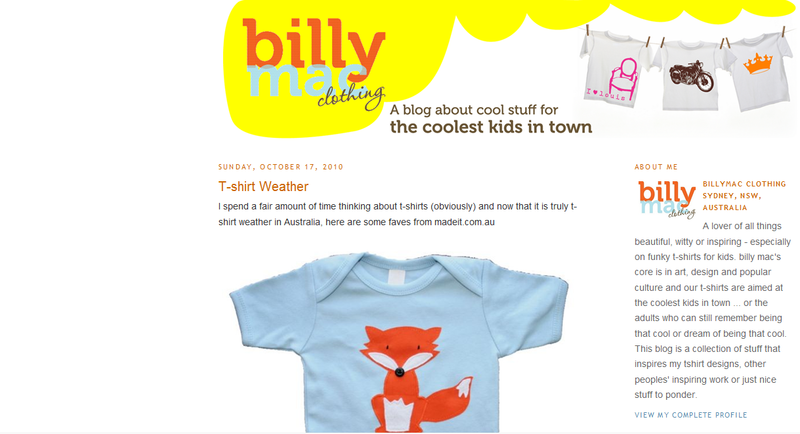 We received a lovely message from Christina of Billy Mac Clothing, to let us know that she had featured our fox shirt in her blog post on some MadeIt T-shirt favourites. So thank you so much Christina for including us. If you have never seen Billy Mac Clothing before, make sure you check them out, some seriously cool prints! I have had this sunny fabric calling me from my stack for ages. Been dying to cut into it! 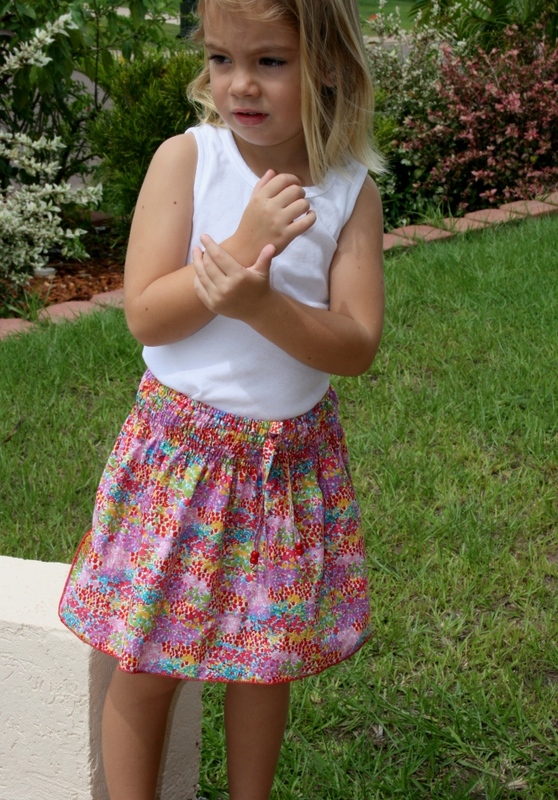 Finally I am pleased that I now turned it into some summery dresses and skirts! 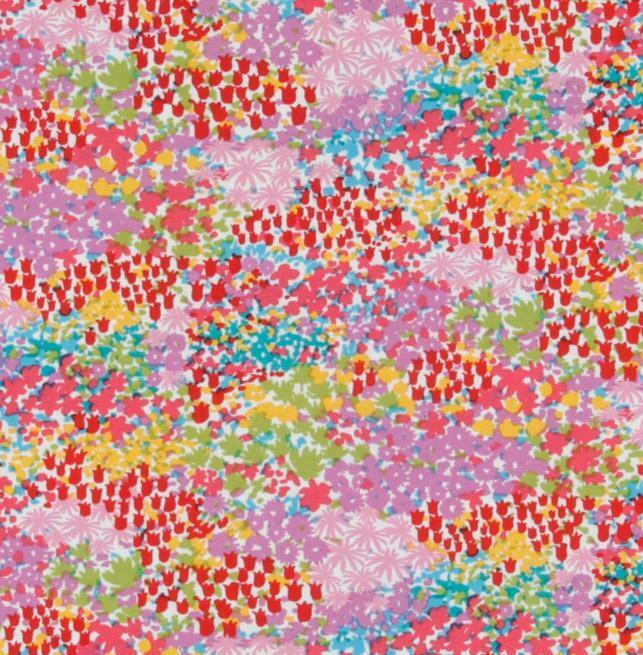 The Molly shirred dress and Summer shirred skirts were the perfect style for this liberty styled floral…I knew it the minute I saw the fabric online. Robert Kaufman plays omage to Liberty of London and when it got here it was even better in real life! Someone has had enough of posing by this stage! It has been some months since Kobie has been able to finally build up the stocks of clip holders again, but at last she has managed it and included Nona in the range for this year. 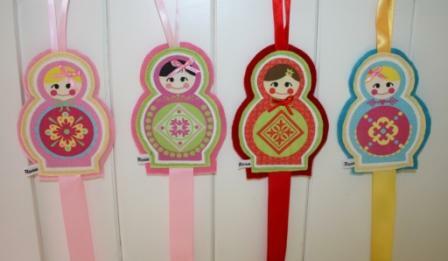 Hopefully soon we will be able to replenish stocks of all our cool Babushka themed items in time for the silly season. Welcome to Ollie Rose! 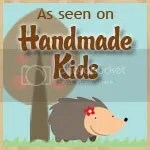 Bringing you unique, funky and quality handmade baby and children's clothing, toys and accessories from around the world. Please do not take any of our original photos or designs without permission. Feel free to link back to here however. Thanks for understanding.